There is only a limited number of works for two or more solo instruments with orchestra. One reason may be that the concerto genre in the 19th century became the stomping ground of the great virtuosi of the day, and the works themselves vehicles for the great and unique talent of one, special performer – not two, or three. Mozart, however, was evidently attracted by the sinfonia concertante genre and created some of the finest examples of it, such as the Sinfonia Concertante for Violin and Viola and the Concerto for Flute and Harp, as well as his two concertos for more than one piano. The ‘Lodron Concerto’ for three pianos was composed in 1776 for Countess Lodron and her daughters. 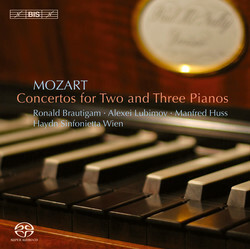 It is Mozart’s third piano concerto and the young man’s irrepressible sense of fun is obvious: in his liner notes conductor and pianist Manfred Huss calls the concerto ‘a true musical joke, in which the musical line is divided between the three players quite arbitrarily; one piano continues what another has started and the third will conclude. The listener hardly notices the humour, however, as the music sounds quite “normal”, and only the pianists know (and the score shows) what Mozart is up to.’ When the composer three years later returns to the task of writing for more than one piano, the result is quite different. The Concerto in E flat major KV 365, composed for Mozart himself and his sister Nannerl, is according to Huss ‘in many respects Mozart’s first ‘big’ piano concerto. It is the first in which we find the very characteristic intertwining of the woodwind and the piano part, accomplished very effectively and virtuosically.’ Mozart seems to have been fond of the work, so fond that for a later performance he added clarinets, trumpets and timpani to the orchestra. Both versions of the score are found on the present recording, played by Alexei Lubimov and Ronald Brautigam, two of today’s finest performers on the fortepiano. The two versions frame the triple concerto, in which Lubimov and Brautigam are joined by Manfred Huss, artistic director of the eminent Haydn Sinfonietta Wien, who here make their first appearance on BIS.